It would be far easier to bring a loaded gun into a California restaurant, movie theater or amusement park under federal legislation picking up speed in Congress and backed by the Trump administration. Despite nearly a year of protests from prominent California Democrats that the bill would undermine the state’s stringent gun control laws, House Republicans on Wednesday passed the Concealed Carry Reciprocity Act on a near party line vote. Among California’s representatives, all the Republicans voted yes and all the Democrats voted no except Julia Brownley of Ventura County, who nonetheless expressed opposition. Long a top priority of the National Rifle Association and gun rights advocates across the country, concealed-carry reciprocity treats permits to carry a concealed firearm in public places like a driver’s license—a permit obtained in one state would have to be honored by another, no matter how easy it is to obtain a permit in a state like Nevada compared to how hard it is in California. And crucially, the bill now on its way to the U.S. Senate would enable Californians to apply for permits from other states such as Florida and Utah with looser requirements—states that don’t require applicants to be residents of that state, and allow the entire application process to happen online. Under current California law, it is incredibly difficult to obtain a license to carry a hidden gun in a public place. Californians have to convince local law enforcement that they have good reason to pack a weapon, such as a specific and credible threat of personal danger. An applicant also has to demonstrate “good moral character,” which law enforcement has lots of leeway to determine. While rural sheriff departments are more amenable, law enforcement in California’s more populated regions typically do not grant many permits. It’s a very different story in other parts of the country. Twelve states—including neighboring Arizona—allow concealed carry without requiring gun owners to obtain any special permit. Under the recently passed House bill, Arizonans who wish to bring their guns to California’s public spaces need only carry with them a driver’s license or some other form of photo identification demonstrating their residency. It’s not just red states that are more lenient with concealed carry. Oregon issued more than three times the number of concealed carry permits than California in 2011, according to a federal report. 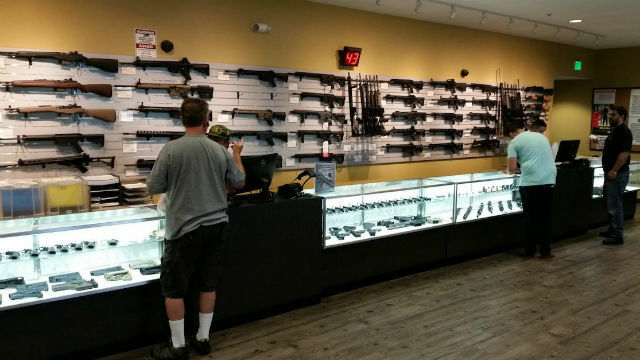 In 2015, more than 70,000 concealed carry permits were granted in California. States with looser concealed carry requirements than California also have less demanding requirements for obtaining a gun in the first place. For example, Arizona has no mandatory waiting period for purchasing firearms or any laws regulating gun shows. That means individuals who could not acquire a gun in California could conceivably bring them into the state and carry them in public. Proponents of concealed-carry reciprocity argue that the measure is necessary for law-abiding gun owners to avoid inadvertently violating local laws when transporting their weapons across state lines. They cite the example of a gun owner lawfully driving with a concealed gun in one state only to be pulled over in another and jailed for illegal possession of a firearm. Hard-line gun rights activists hope the impact of the bill in California is much broader, especially if the ability of California residents to obtain permits in other states is preserved. A Senate version of concealed-carry reciprocity, which has yet to receive a vote, does not contain that provision. “The net effect of this bill is that California becomes a ‘shall-issue’ state. Period,” said Paredes, who added his organization would not support the Senate bill in its current form. Gun control advocates believe the legislation will have a much tougher time clearing the Senate, where it will need 60 votes and some Democratic support to pass and survive a filibuster. House Republicans married concealed-carry reciprocity to a measure strengthening federal background checks on gun purchases, a political tactic Senate Republicans have chafed at. Gun control advocates warn that should concealed-carry reciprocity become federal law, California and other states with strict gun control restrictions may have to quickly respond to a new reality for which they are unprepared. Because concealed-carry permits are already so hard to get here, California doesn’t have many laws on the books detailing where you can and can’t bring a gun. For example, in California it is legal to bring a weapon into a restaurant that serves alcohol if you have a concealed-carry permit. Of course, the restaurant owner can tell a patron with a concealed firearm to leave, or to post a sign saying no guns are allowed on the premises. But the owner has to recognize that an individual is carrying a hidden weapon in the first place. And even if the gun owner refuses to depart, he or she would only be guilty of trespassing and not subject to more severe criminal penalties. Advocates on both sides of the issue agree that should concealed-carry reciprocity become law, it will likely end up in federal court. California could be a likely party to such litigation: state Attorney General Xavier Becerra has already expressed his opposition to the legislation, and he has sued the Trump administration multiple times on other issues.